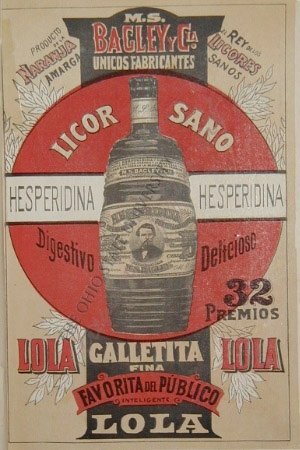 Legal white-dog whiskies, as the unaged stuff is called, aren’t exactly new to the market. I tasted some at Tales of the Cocktail in 2008. 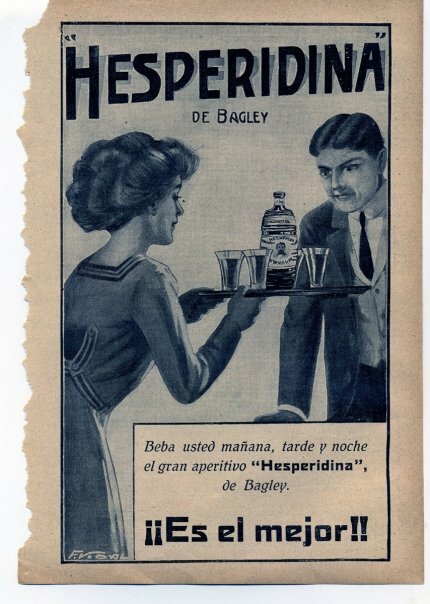 But they’ve been slowly gaining ground among bars and consumers since then and started making their way onto cocktail menus. As I mentioned above, one popular way is to replace the brown spirit in a classic whiskey drink with a white. I wanted to riff on this, but instead of using a white dog, I chose Bols Genever. It’s a favorite in our household, a malty botanical spirit that’s the precursor to modern gin. Bols tastes uncannily like whiskey, so I thought it would play well in this type of preparation. I tried a couple of different ideas–one using Carpano Antica vermouth–to re-create the Manhattan cocktail, but this is the one we liked best. Stir, squeeze on lemon peel, discard peel. 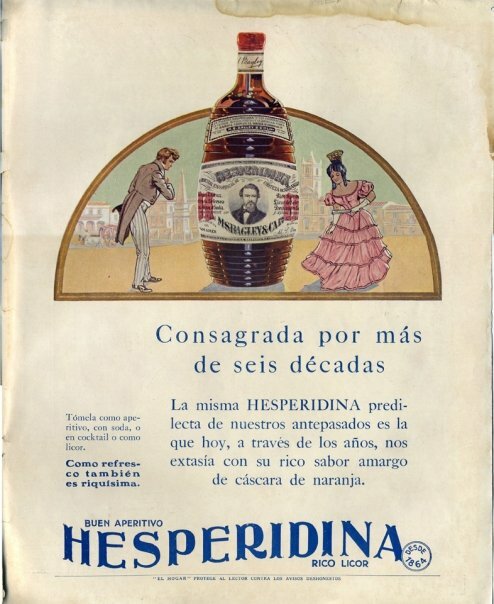 Finishing up the set of ads from the Hesperidina. Many thanks to Federico Cuco for sending them along. 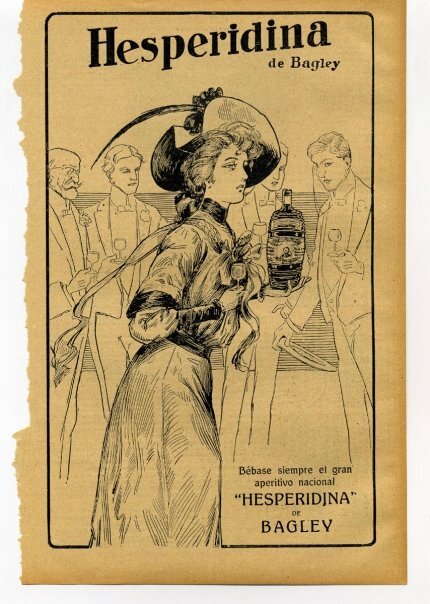 More ads from the Hesperidina set. Many thanks to Federico Cuco for sending them along. 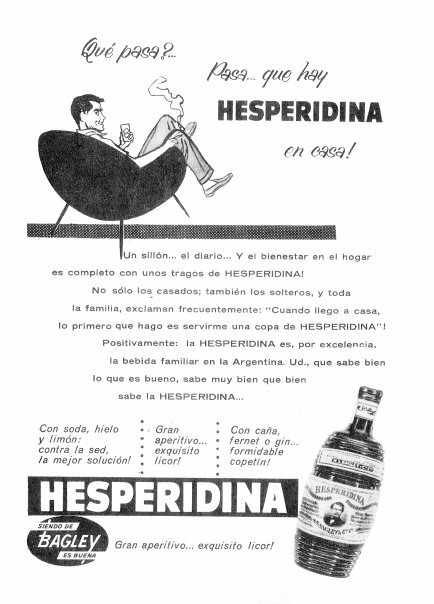 Here’s something a little different–a group of ads for Hesperidina, an orange-flavored aperitif popular in Argentina. (As far as I know, it’s not imported into the United States.) These were sent my way by Federico Cuco, a Buenos Aires barman. With his permission, I’m publishing them here, two per week. I don’t know anything about their original source, but you’ll see that some of them are pretty old. 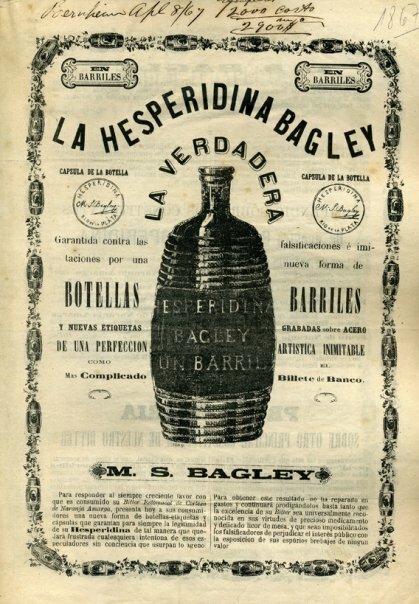 The brand dates back to 1864, when it was invented by an expatriate American, Melville Sewell Bagley. These ads are excellent, and the scans are crisp, so I wanted to run them. Many thanks to Federico for sending them along. Stimulate your palate with some fun apéritifs, courtesy of the fourth Mixology Monday (hosted this go-around by Jimmy Patrick of jimmy’s cocktail hour). Jen and I wanted to try something a little different this time. Since we so often get apéritifs along with appetizers when we’re out a good restaurant, we talked about doing some food pairings. We talked for a couple of weeks about what we’d have and what we’d pair. I knew, for example, that I wanted to try Cynar (having previously only had it in Audrey Saunders’ Little Italy cocktail at Pegu Club), so we took our cues either from what I wanted to mix with or from what she was eager to cook. I would then write up the boozy stuff for this site and MxMo, and she’d blog the foodie bits over at the food blog Gastronome. So there you go. First up, the Adonis cocktail with figs, stuffed with blue cheese, wrapped in serrano ham, and roasted in the toaster oven. Jen requested sherry, since it’s a classic pairing with figs and blue cheese, so I consulted my oracles to find a good sherry-based quaff. Difford’s Guide to Cocktails provided several options, and from them I chose the Adonis, a simple mix of sherry, vermouth, and orange bitters. Stir over ice, strain into a chilled cocktail glass, and garnish with an orange twist. That’s a good drink. I was surprised by its smokiness, though. Sherry never strikes me as being smoky on its own, but somehow with the vermouth and orange bitters, the drink was smoky, like a scotch cocktail. Strange, but a nice example of the alchemy that occurs in a cocktail glass. Our second pairing was artichoke-a-riffic: artichoke hearts topped with crabmeat and roasted in the toaster oven. The pairing for that was simple: Cynar on the rocks with a slice of lemon. We both found the Cynar a little sweet on its own, so perhaps we’ll shake it into a drink next time. The night after our cocktail party, we went to Dressler, a new restaurant in South Williamsburg, Brooklyn. We’d been to Dressler once before–on its opening night, we sat at the bar, and ate while talking drinks and barmanship with the friendly bartender. On our second visit, we had a different bartender, but he was every bit as personable as the first guy had been. 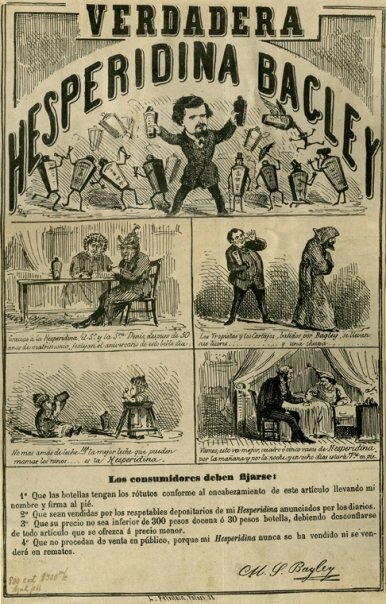 Technique: Rinse champagne flute with both kinds of bitters. Pour out most of the bitters, leaving a small amount in the bottom of the glass. Shake bourbon and triple sec over ice, and strain into flute. Top with champagne. Oh, and in case you were wondering, these were indeed apéritifs. Even with all that food, we still managed to eat grass-fed tenderloins and a salad for dinner, with a nice Chianti Classico.